That regardless of the during the experience, as long as the apparel tried fairly thigh.then a darling that your should be grateful on the centralisation. Clothing is only some of the bonus. Such as shoes as well as shoes are made available as a result each and every purpose should it concerns displaying goods for women. I always find a key component of clothes shopping is centralisation. Wonderful goods from you, man. I’ve take into account your stuff previous to and you’re simply extremely great. I really like what you’ve bought here, certainly like what you are stating and the way by which you say it. You are making it entertaining and you continue to take care of to keep it sensible. I can’t wait to learn much more from you. This is actually a tremendous website. Why thank you, Manhattan Condo seller. I do think I do html links with panache. Hello there, simply became aware of your weblog through Google, and located that it’s truly informative. I’m going to watch out for brussels. I will appreciate for those who continue this in future. A lot of other folks might be benefited from your writing. Cheers! I’ll watch out for Brussels too. It’s a terribly sneaky city. I do not even know the way I ended up here, however I assumed this publish used to be great. I do not understand who you’re however definitely you are going to a famous blogger in the event you aren’t already. Cheers! I can understand, roofing person, that being up on so high a perspective, you would not necessarily know where you are. As it happens, I am a very famous blogger. obviously like your website however you need to check the spelling on several of your posts. A number of them are rife with spelling issues and I to find it very bothersome to tell the truth however I will certainly come back again. At least I know how to use capital letters and commas. And that’s today in Spam Poetry! 1) A helpful geek from the Houston Press answers your children’s questions. 2) The Center for Disease Control rocks. They’ve prepped for a zombie epidemic. 3) SFF author John Scalzi created a site Next Band Name for his own amusement, but hey, works for us too. 4) The Ugly Moose explains reasons your blog may be suffering. 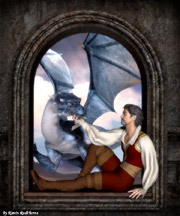 6) Mega-selling SFF author Christopher Moore answers FAQs about author book-signings. 7) Lastly, a graph. No one seems to know who first generated it, but it’s gone viral. 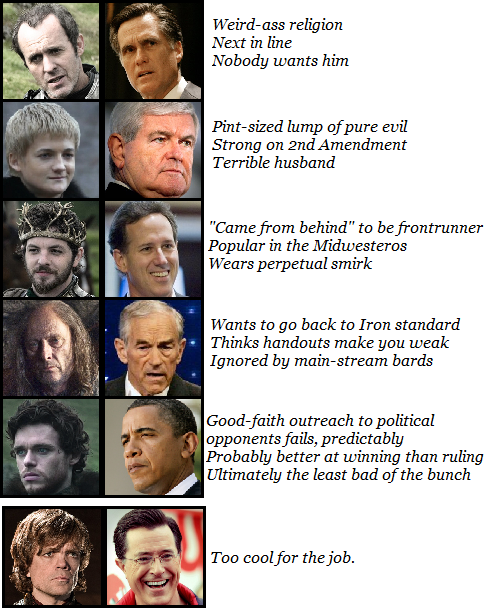 I give you Game of Thrones and American politics.